‘If you want to grow all these pumpkins, you’re going to have to be able to sell them’ was one caution the Scheeringa girls heeded when they took over the operations of Scheeringa Farms in Highland. The 3rd generation of Scheeringa farmers – Jennifer, Jeannine, and Janille – have done that and more. Growing and selling corn, tomatoes, peas, cucumbers and other vegetables has been the mainstay since 1967 when Grandfather Bill started the farm and opened a stand. Dad Don expanded the farm, leasing land to plant more. Hoop houses and green houses were added to satisfy customer demands for seedlings, decorative plants and flowers. Some seasons, they have a u-pick on produce. At Saturday’s Customer Appreciation Day, traffic attendants directed cars to available spaces on the farm and to an overflow lot in the church across the street. 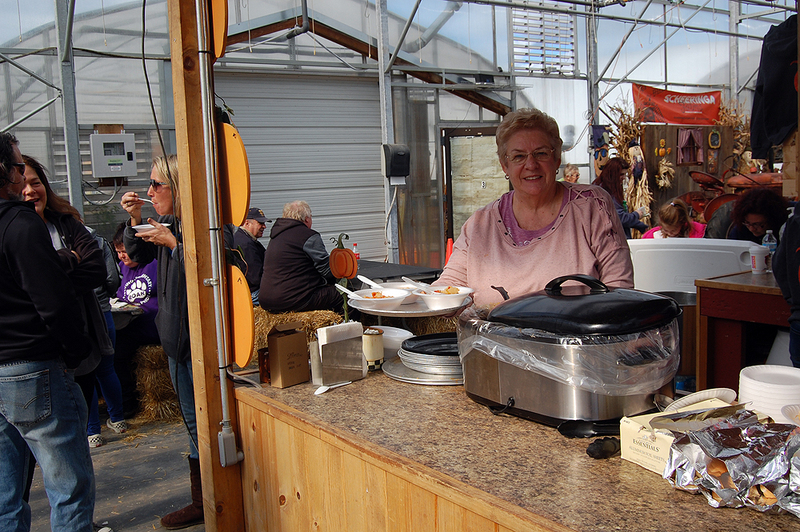 Drawing the large crowds Saturday was the experience of Scheeringa Farm, built up by Jennifer and her sisters. 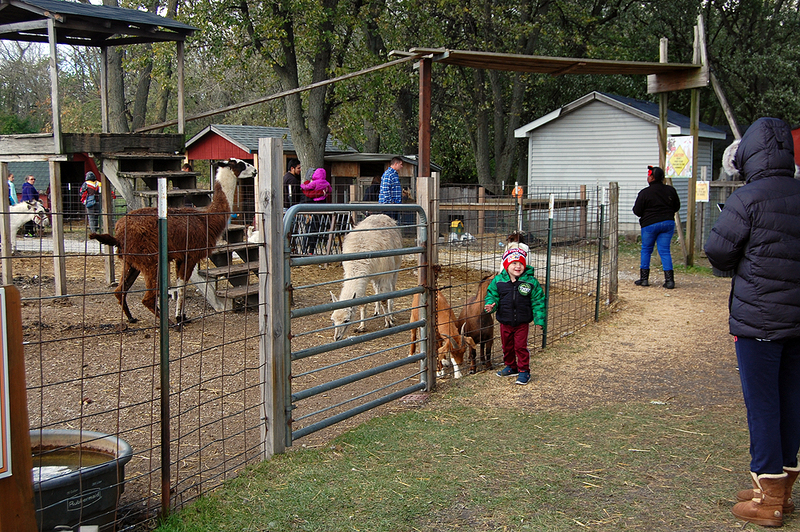 They started with a small petting zoo. Parents with young children loved it. That was expanded. A hayride and bounce house were added. A kiddie train pulled by a tractor tours the farm. 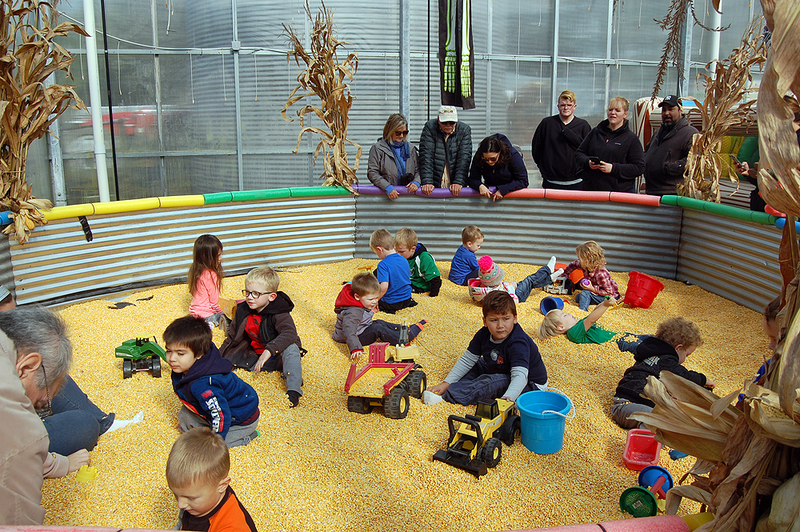 Inside the large greenhouse, at one end they have transferred the idea of a sandpit to create a corn bin for toddlers to play. At the other end, a donut kitchen. In the middle, a small food stand. Hay bales provide the seating. Next year will bring changes to the farm. The land they’re leasing and have long tried to buy, along Cline Avenue between the farmhouse and Strack & Van Til has been sold. A municipal garage and housing development will replace the farmland. The family will continue to farm the land west of the farmhouse, over to Kleinman Road. 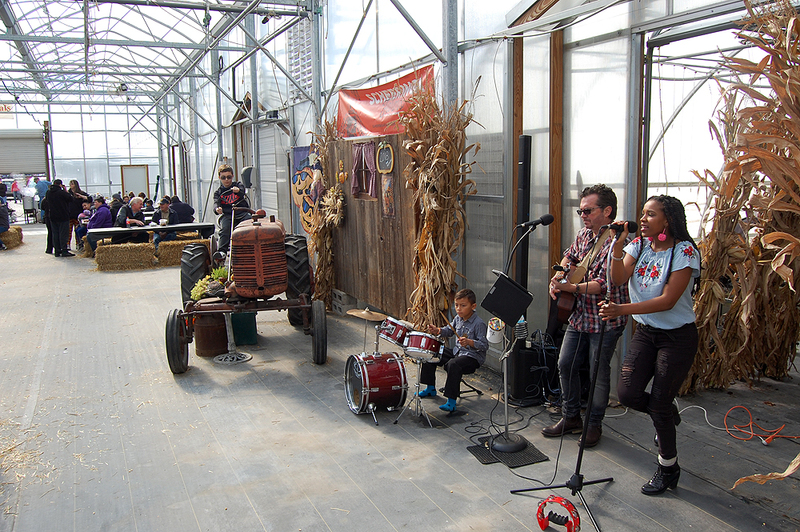 The farm stand and greenhouses will remain. “It’s going to be a new learning curve for us,” Jennifer said. And, mostly everyone left with a pumpkin.